Old Town Churn Ice Cream is the newest member of the Little Man Ice Cream Company, known for its inventive, nostalgic ice cream parlors. Inspired by an antique wooden ice cream churn bucket, the shop resides in a larger than life 26-foot- tall ice cream churn. Crafted from Fir wood and accented with a 2,000-pound forged steel hand crank, Old Town Churn pays tribute to the agricultural roots upon which Fort Collins was built. Churn serves as the flagship anchor in The Exchange, a new retail, restaurant, and entertainment destination that is a catalyst for the revitalization and creative expansion of Old Town’s northern edge. It was originally the site of a livestock exchange. Churn will serve a rotating line-up of Little Man’s handcrafted ice cream as well as shakes, malts, sundaes, banana splits, ice cream sandwiches, and the all-important “Pup Cup” in the Exchange’s dog-friendly environment. For ice cream connoisseurs, Churn will debut exclusive Little Man Ice Cream flavors with a nod toward Fort Collins where college, culture and agriculture meet. Partnerships with Fort Collins craft breweries, local farms and dairies have inspired four new flavors including: “Boilermaker” pairing local New Belgium Brewing Fat Tire caramel beer plus a shot of whiskey with cinnamon toast crunch; “Matcha Honey” is made with local raw honey from iIndulge; “The Exchange” pairs a Brie cheese base with crispy pancetta and Ritz crackers; and “All Nighter” is an Espresso fudge that makes a perfect pairing when cramming for an exam. Aside from delicious ice cream, Churn’s commitment to community building will be brought to life in the Exchange’s open-air plaza where a range of seasonal celebrations, live music, school performances, arts & culture and family-friendly events will foster neighborhood connections. Community collaborations also take shape through Churn’s philanthropic mission. Since Little Man Ice Cream’s first shop opened in 2008, it was built on the belief that business exists to make a difference in the world. Since day one we have made giving back an integral part of who we are, and our Scoop for Scoop Program is how YOU help us to make that difference! For every scoop of ice cream purchased, a scoop of rice, beans or other essentials are donated to communities in need around the globe. Scoop for Scoop is about helping the world’s most vulnerable regardless of circumstance. Churn will reflect this ethos by giving back a portion of proceeds to support agricultural and artistic alliances that make up the backbone and history of Old Town Fort Collins. Making a difference has never tasted so good! 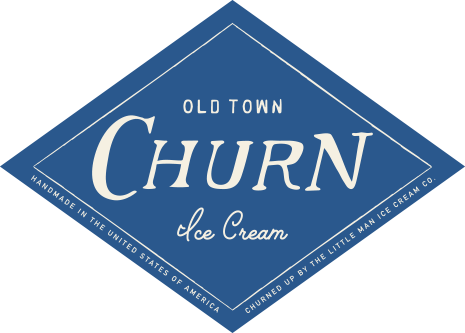 Keep in the know about upcoming events, community collaborations and ice cream specials by dropping off your email address at the Churn….Plus, follow us on Facebook@oldtownchurn and Instagram. #ChurnUp. Since Little Man Ice Cream’s first shop opened in 2008, it was built on the belief that business exists to make a difference in the world. Since day one we have made giving back an integral part of who we are, and our Scoop for Scoop Program is how YOU help us to make that difference! For every scoop of ice cream purchased, a scoop of rice, beans or other essentials are donated to communities in need around the globe. Scoop for Scoop is about helping the world’s most vulnerable regardless of circumstance. Are you enthusiastic and believe you can deliver The Old Town Churn Ice Cream-worthy customer service? We encourage you to apply, please select which criteria you meet below. Why do you want to work at Old Town Churn? I understand that this application does not guarantee employment. This application has been completed with the intent of acquiring a job at Old Town Churn Ice Cream. All information given is true to the best of my knowledge. I also understand that Little Man Ice Cream Company follows Colorado Labor Law Practices. If hired, I am an at-will employee and can be terminated with or without cause. I also understand that there is seasonality to the business that may lead to being laid-off for a time period.